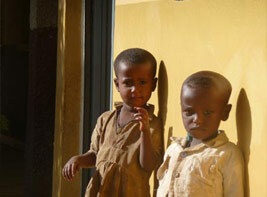 This is our fourth newsletter detailing our recent trip to Bahir Dar, Ethiopia, February 2008. This year was slightly different as we took along a friend. Jane’s teaching assistant and culinary skills proved a great hit. This also allowed us extra baggage allowance taking out more of your donated items. This year this included many baby and children’s clothes, vegetable seeds, sewing items, books, toys, the obligatory football shirts and Jesus (more on that later). Once again your ongoing funding is making a huge difference, we saw many more houses being built and the lives for some are improving. However the biggest shock we had was the increase in prices, a world problem but one that is hitting the poor the hardest. A box of nails for house building has increased from £4.00 to £8.00; the cost of an ox has increased three fold and grain has doubled. It is noticeable that the poor are getting poorer and the level of affluent people in Bahir Dar has risen.